A BRAND NEW comedy-and-cooking show from the award-winning stand-up who makes real food live on stage. In his first show, ‘Anarchist Cook’, George made a meal in a hotel room with the complimentary appliances. In his second, ‘DIY Chef’, he was stuck in a shed cooking with power tools. In this show he’s on the road! It’s time for Planes, Trains and Automob-meals (sorry). During an hour of live cooking and laugh-out-loud comedy George will demonstrate how to cook with an engine, get the most from the car battery and even utilise the roof rack. He’ll demonstrate ways to procure items from the train buffet trolley, beat the rip-off restaurant prices at the airport and show how to turn unexpected road-works into a picnic. It’s cheeky, anarchic and creative, a multisensory show rich in humour and sprinkled with handy hacks. 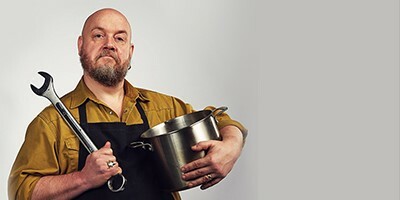 Three plates of gourmet food cooked live in the most unconventional ways and with the opportunity to taste the results at the end, provided you can stop laughing in this brand new Edinburgh preview.